Wonderful! Perfect for the opening of the Turner Centre! Ha, thanks Mike. Maybe I should send it to them! I'd like to be there at the opening of the Turner Centre, but I believe it clashes with the Shrewsbury Cartoon Festival. Thanks, Morten. Such comments make me feel like even more of an idiot for leaving it festering in my notebook for so long! 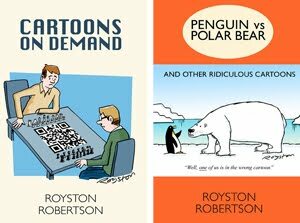 Cartoonists are often the worst judges of their own work. Heh, not quite. That's exclusive to the web version, you lucky people. Yes - absolute corker! Glad you decided to revisit the notebook. Wouldn't work so well if it was all colour I think - good choice RR and RD! 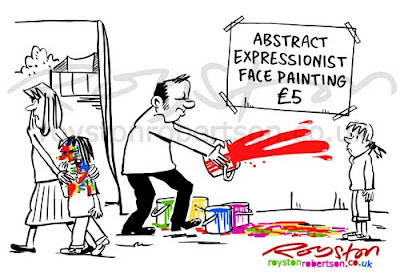 Great cartoon, Royst! A similar thing has happened to me a few times - not sure why an idea suddenly seems so much funnier at a later date. This is a really good one. Yes, it's a mystery. It's far from the first time it's happened either. I find it hard to find the enthusiasm to draw up a cartoon if I don't have confidence in the joke, so sometimes I leave them for later. I love the child walking away being consoled by her mother. One of your best, Royston. He should have a spliff and a bottle for the full Jackson Pollock - very funny joke, Royston.